Short-chain surfactants such as octyl sulfate are used to provide a solvent-like cleaning function in detergent compositions. Preferred bleach-containing hard surface cleaners comprising the short-chain surfactants and long-chain surfactants, are especially useful for bathroom and kitchen clean-up operations. Compositions with long-plus-short chain surfactants including alkyl sulfates, olefin sulfonates, amine oxides and the like, are disclosed. TECHNICAL FIELD The present invention relates to cleaning compositions and methods which employ short-chain surfactants. While not limited to any particular type of cleaning operation, the compositions herein are especially useful as hard surface cleansers, e.g., for use on walls, countertops, floors and the like. The compositions which contain hypochlorite bleach are especially useful for removing kitchen and bathroom dirt, including the greasy soap scum-types of soils that are associated with bathtubs, shower stalls and bathroom sinks. CROSS-REFERENCE O RELATED APPLICATION This application is a continuation-in-part of co-pending U.S. Application Serial No. 07/970,665, filed November 3, 1992. BACKGROUND OF THE INVENTION When considered superficially, it might appear that the formulation of cleaning compositions of various types would be a matter of routinely selecting various detersive surfactants, detersive bleaches and various detersive adjuncts from the wide variety of such materials known in the art, and combining them to achieve whatever level of cleaning performance is desired. However, on further investigation it is found that this is not the case, especially when superior cleaning is desired. For example, many of the myriad, art-disclosed detersive surfactants are little more than technical curiosities designed for use in specialized operations, and are so expensive that they find no practical use in economical cleaning products of interest to the average con- sumer for custodial cleaning in the home or business. Various bleaches can be used in cleaning, but may be incompatible with various surfactants. Likewise, detersive adjuncts such as abrasives may be suitable for use on some hard surfaces, but be damaging to other surfaces. Accordingly, the for ulator of such compositions is faced with difficult choices when developing superior cleaning products. The formulation of superior cleaning products for use in kitchens and bathrooms provides special challenges, inasmuch as kitchen soils tend to carry a heavy load of greasy and protein- based materials, and bathroom soils tend to carry a heavy load of "soap scum" materials. Moreover, the environmental surfaces, i.e., fixtures, countertops, sinks, tubs, etc., in kitchens and bathrooms are generally made of highly reflective materials, including various types of tile, glass and chrome-plated metal, on which even minor amounts of soil are highly visible. Accordingly, the consumer expects that modern cleaning products will safely and effectively remove even the final traces of dull, unsightly soils from such surfaces. Historically, kitchen and bathroom cleaners were highly abrasive powders, perhaps with a bit of added surfactant, and were aptly referred to as "scouring" cleansers. They were harsh, not only on the user's hands, but also on the surfaces to which they were applied. Bleaches were later added to such compositions to break down soils and assist in their removal. While modern abrasive cleansers are formulated to be safer on surfaces and more compatible with skin, such cleansers still rely mainly on the action of the abrasive to remove soil, especially the relatively thick, greasy soap scum soils noted above. With the advent of liquid cleansers, for ulators began using certain solvents to improve cleaning performance. Various alcohols, as well as terpenes present in the well-known lemon oil and pine oil cleansers, were used. While in some instances the amount of such solvents did little more than provide an aesthetic benefit, in others the use of pine oil was at such a level that true solvent cleaning benefits were achieved. In still more modern liquid cleansers, materials such as butyl carbitol are used at solvent/cleaning levels. Apparently, however, many formulators of liquid products were still aware that their products did not perform in optimal fashion. In yet another move to enhance cleaning performance, especially against greasy soils, various suspendable abrasives were added to some liquid cleansers. While the foregoing would appear to provide a natural progression in the formulation of ever-improving cleaning composi¬ tions, the use of abrasives, bleaches and solvents is not without its limitations. Too much abrasive, or too harsh an abrasive, limits a product's usefulness. Too much bleach leads to irrita¬ tion of the user's hands. Too much solvent can yield noxious odors, skin and eye irritation, and, at the extreme, flammability of the product. In a manner not unlike that seen with hard surface cleansers, the development of fabric laundering compositions has been a progression of steadily improving technologies, starting with common soaps, through synthetic detergents, built detergents, enzyme detergents, up to and including the most modern detergents with bleaches and bleach activators. Despite of the wide recognition that various liquid solvents can provide outstanding removal of greasy soils and stains from a wide variety of surfaces, comparatively little attention has been paid to the solvent mode of action for cleaning purposes, outside of dry cleaning operations and, as noted, in certain modern hard surface cleansers. Presumably, that may be due to various formu¬ lation and other problems associated with the use of solvents. Some solvents may be toxic, malodorous or flammable at effective usage levels. Liquid compositions containing high levels of solvents and ionic ingredients may be unstable, due to the well- known "salting-out" effect. Still other solvents may be so strong as to dissolve various plastic materials with which they come in contact. In any event, the traditional solvents are all liquids, and are thus unsuitable for formulation into powdered or granular cleaning products. The cleaning action of bleaches can contribute importantly to the overall effectiveness of hard surface cleaners. Unfortun¬ ately, the use of conventional hypochlorite bleaches with conventional solvents can lead to instability of liquid cleaning products. U.S. Patent 4,282,109 relates to thickened bleach composi¬ tions with amine oxides and alkyl sulfates. U.S. Re Patent 34,065 discloses hypochlorite disinfectants with t-butanol and sodium dodecyl sulfate. See also EP 137,871; BE 858,460; U.S. 4,005,027; EP 156,438; U.S. 4,552,680; and EP 373,864.
wherein R3 is a C12-C20 alkyl substituent and R4 and R5 are each C1-C3 alkyl substituents, at a weight ratio of (i):(ϋ) of about 4:1, or greater. The invention also provides preferred hard surface cleaning compositions, especially liquids, which additionally comprise a hypochlorite bleach. The liquid compositions herein can addition¬ ally comprise a thickener, and such thickened compositions cling to vertical surfaces to assist in cleaning. In another embodiment, the invention provides liquid, bleach- containing cleaning compositions which comprise: i) from about 1% to about 2% by weight of a hypochlorite bleach; ii) from about 0% to about 5% by weight of a bleach-stable, long-chain surfactant (as defined hereinafter) which is a member selected from the group consisting of long-chain amine oxides, long-chain paraffin sulfonates and long-chain alkyl sulfates; iϋ) from about 0.6% to about 20% by weight of a short-chain surfactant; iv) an aqueous carrier, said composition having a pH of about 12, or above, preferably 12-13. In preferred compositions (especially those containing amine oxide surfactants) the weight ratio of surfactant (iii):surfactant (ii) is greater than 1:1, preferably greater than 2:1, most preferably 4:1, and greater. Such compositions which comprise from about 1% to about 2% of hypochlorite bleach, about 1% by weight of said long-chain sur¬ factant, and from about 4% to about 8% by weight of said short- chain surfactant, especially wherein the long-chain surfactant is an amine oxide and wherein the short-chain surfactant is octyl sulfate (Na form is convenient), are particularly useful for removing kitchen and bathroom soils. Such compositions can optionally contain a thickener, as noted above. Solid compositions herein are as noted above, and can use a solid source of chlorine bleach such as sodium dichloroiso- cyanuate. In yet another aspect of this invention, it has also now been discovered that compositions without amine oxides perform well and are bleach stable at weight ratios of long-chain:short-chain surfactant of 1:1 and greater as disclosed hereinafter. The invention also encompasses a method for cleaning hard surfaces by applying thereto a composition according to this invention. The invention is based on the observation that it is possible to improve the cleaning properties of a cleaning composition which contains at least one long-chain detersive surfactant by admixing with said composition an amount of a short-chain surfactant which preferably comprises at least about 1%, more preferably at least about 2%, by weight of said composition. In embodiments of the invention which contain amine oxides, the amount of short-chain surfactant is greater than the amount of long-chain surfactant, although, in bleach-containing compositions this can be varied, as disclosed more fully hereinafter. This method of improving the cleaning properties of otherwise conventional cleaning compo- sitions by adding "solvent-like" short-chain surfactants is also encompassed by this invention. The present invention is based on the discovery that certain short-chain surfactants, as described hereinafter, can co-act with conventional long-chain surfactants to provide a cleaning mechan¬ ism which is not unlike that which occurs with solvent cleaners. Stated otherwise, the short-chain surfactants provide a "pseudo- solvent" cleaning function in the compositions. While not intend- ing to be limited by theory, it is speculated that this pseudo- solvent cleaning activity is the result of a disruption in the phase structure of "soap-like" soils and/or reduction of the viscosity of greasy/oily soils by the penetration and diffusion of the short-chain surfactant into such soils. The following is a listing of the types of materials used in the practice of this invention. Short-chain Surfactants - As in the case with conventional surfactants, the "short-chain"" surfactants used in the practice of this invention comprise a water-solubilizing hydrophilic substitu- ent and at least one, or more, hydrophobic hydrocarbyl substitu¬ ents. The hydrophilic substituent can be any of the common anionic substituents known for use with detersive surfactants, including especially sulfate (preferred) and sulfonate hydrophilic groups. When preparing compositions herein containing hypochlor- ite bleaches, short-chain surfactants which contain no oxidizable moieties, i.e., without ethylene oxide, ether links, free hydroxyl groups, amine groups, sulfite groups, or the like, should be chosen. With respect to the hydrophobic portion of the short- chain surfactants, this will typically comprise a hydrocarbyl (alkyl is preferred, but alkenyl may also be employed) group generally containing 8 or less carbon atoms in the longest hydro¬ phobic hydrocarbyl chain and will typically contain from C4-C8 carbon atoms in the longest hydrocarbyl hydrophobic chain. By way of further explanation, 1-octyl sulfate, which is preferred herein, has the sulfate hydrophilic substituent group on the terminal carbon atom, and thus has a Cβ chain length. Short-chain internal paraffin sulfonates having the formula R2CH(Sθ3M)R2, as noted hereinabove, will have hydrophilic sulfonate substituent primarily on the second or third carbon of the hydrocarbyl group and thus may be considered to have a chain length in the longest hydrophobic portion of the molecule of about Cβ or C7, respec¬ tively, not counting the carbon atom to which the SO3 moiety is attached. It has been determined that very distinct optima in the "solvent-type" cleaning performance of the sulfated short-chain surfactants occur as a function of the chain length of the hydrophobic group. In particular, pseudo-solvent cleaning performance of the preferred sulfate short-chain surfactants occurs at 1-hexyl sulfate and 1-octyl sulfate. Typical usage levels of the short-chain surfactants are from about 2% to about 8% by weight of the compositions herein. Long-chain Surfactants - The "long-chain" detersive surfact- ants herein comprise any of the conventional, water-soluble detersive surfactants which are well-known in the literature for conventional use in cleaning compositions. Such materials include, for example, the C12-C20 alkyl sulfates, the C12-C20 alkyl and alkenyl sulfonates, the C12 and higher alkyl benzene sulfonates, the C12 and higher phosphine oxides, the C12 and higher dialkyl amine oxides, especially including the dodecyl dimethyl amine oxide (C12 dimethyl amine oxide), which is a preferred type of material for use herein, and the like. The long-chain anionics exhibit their best performance when bleach is present. The long-chain amine oxides provide excellent perform¬ ance, both in the presence and absence of bleach. Typical examples of a wide variety of long-chain detersive surfactants suitable for use in cleaning compositions, including those of the present invention, are available from standard texts. As noted for the short-chain surfactants, when hypochlorite bleach is used in the liquid compositions herein, it is important to choose long-chain surfactant molecules which have no oxidizable moieties. Typical usage levels of the long-chain surfactants are from about 0% to about 5% (or 8% for non-a ine oxides), more preferably l%-6%, by weight of the compositions. When hypochlorite stability is desired and an amine oxide is the long-chain surfactant, it is preferably used at about 0.5%-2% levels. Bleach - Preferred liquid hard surface cleaners herein will contain hypochlorite bleach, which is available as a standard aqueous solution and at pH 12-13. If used, the typical levels of hypochlorite in liquid compositions will be from about 1% to about 2.5% (or as high as 3% for the most stable surfactant amounts and proportions) by weight of the compositions. Solid compositions can contain various solid sources of chlorine bleach, such as sodium dichloroisocyanurate (NaDCC), generally at levels of at least 2%, typically 2%-3%. Thickener - Liquid compositions of the present invention may optionally be prepared without thickener. However, for many uses it is preferred to have a thickener present in order to promote adhesion of the composition to the surface being cleansed. While various thickeners may be used, it is preferred for stability reasons to employ cross-linked polyacrylic acid thickeners when preparing compositions with hypochlorite bleach. One such thick¬ ener is available from the 3-V Chemical Corporation under the tradename POLYGEL DK. This thickener is an anionic carboxy vinyl polymer which is in the form Of a fine white powder which, after full or partial neutralization with alkali, forms viscous solu- tions or gels which are compatible with electrolytes. It has now been determined that such viscous solutions are also stable with hypochlorite bleach, especially in the presence of sodium benzoate stabilizer. If used, the typical usage levels of polymeric thickener will be from about 1% to about 2% by weight of the compositions. Fatty acids in the chain length range of from about C12-C18 can be used to provide thickened compositions. Typical usage levels are 0.5% to 1.5% by weight of total composition. If bleach is present, the fatty acids should be saturated to avoid interac- tion with the bleach. Other thickeners useful herein both with and without hypochlorite include clays, especially bentonite, hectorite or other montmorillonite clays. Commercial clays suitable for use herein include HECTABRITE DP, MAGNABRITE HV, POLARGEL HV, VOLCLAY NF-BC, LAPONITE XLS, BENTONE EW and GELWHITE H-NF. Typical usage levels to achieve thickening are at least about 1.0%, and range from about 1.0% to about 2.5% of the compositions herein. Thickened solution viscosities will preferably range from about 50 cps to about 300 cps as measured by Brookfield Viscometer. Fluid Carrier - The preferred liquid compositions of the present invention will typically comprise from about 85% to about 95%, by weight of a fluid carrier, preferably water. Water/alco¬ hol (e.g., ethanol; isopropanol) mixtures can also be employed in liquid formulations which do not contain the chlorine bleach. Optional Adjunct Materials - Compositions which employ the technology of the present invention involving the pseudo-solvent short-chain surfactants can, in addition to the foregoing ingredi¬ ents, comprise various optional detersive adjunct materials. For example, for fabric laundering and certain other cleaning opera¬ tions involving hard water, various detergency builders may be present in the compositions typically at levels from about 5% to about 50%, by weight. Typical builder materials include the zeolites, especially Zeolite A, the polycarboxylate builders, especially citrate and oxydtsuccinate builders, and the like. Likewise, such cleaning compositions can, if desired, contain detersive enzymes, including, for example, proteases, amylases, Upases, and the like. The use of detersive enzymes is typically at levels from about 0.01% to about 2% by weight. Likewise, solid compositions can contain granular carriers, including sodium sulfate, sodium carbonate, and the like. The compositions herein can be formulated as bars useful for hand-washing of fabrics. Abrasives, especially silica and calcium carbonate and commercially-available synthetic abrasives, can be present in the compositions. Powdered cleansers may contain as high as 95% abrasive or solid carrier; liquid cleansers may typicall contain up to about 30% by weight of abrasive. Various perfumes, bacteri- cides, sanitizers, colorants, and the like can all be present as optional adjuncts in finished formulations. Soluble carbonates such as sodium carbonate at levels of 0.5% to 2% are particularly useful in liquid and solid cleansers of the present type when hypochlorite is not used. It is one of the advantages of the present invention that enhanced cleaning performance can be achieved by the addition of the short-chain surfactants herein without otherwise causing the formulator to resort to the use of unconventional ingredients and detersive adjuncts. Accordingly, while the foregoing listing of Optional Adjunct Materials is instructive, it is by no means intended to be limiting of the invention, and other such materials can also be used herein. Method-of-Use - The compositions of the present invention, especially the liquid compositions and, most particularly, the liquid bleach-containing compositions, are designed for direct application to the surface being cleaned. This is especially true when cleaning bathroom and kitchen soils from bathtubs, counter- tops, and the like. Application of the product may be by any convenient means, e.g., sponge, pad or the like. In an alternate mode, the compositions herein can be diluted in water prior to application, according to the desires of the user. Having thus described the invention in substantial detail, the following Examples are included to further illustrate the practice of the invention, but are not intended to be limiting thereof. EXAMPLE I An unthickened liquid bleach-containing cleanser for bathrooms and kitchens is prepared by admixing the following ingredients. 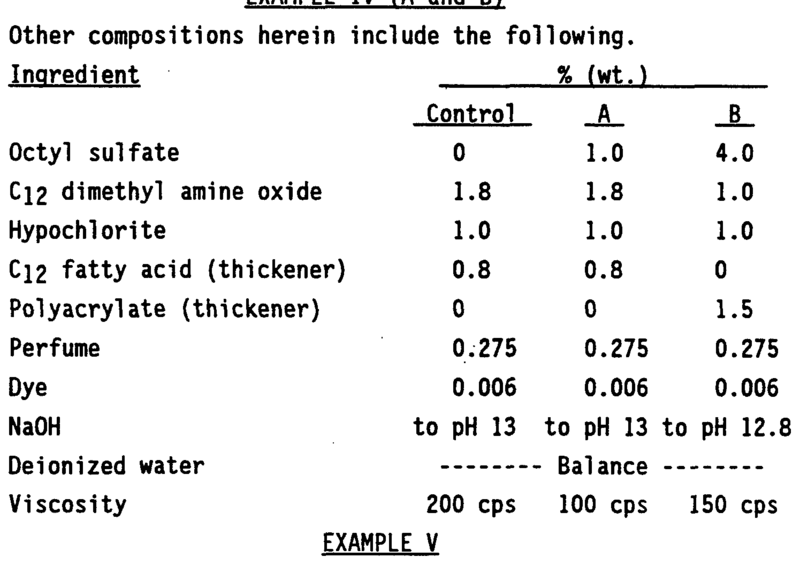 Deionized water Balance *2% total hypochlorite in finished product; added as sodium hypochlorite. EXAMPLE II (A. B. C) Thickened liquid bleach-containing cleansers for bathrooms, kitchens and other hard surfaces are as follows. Ingredient % wt. The compositions of Example II are modified by replacing the octyl sulfate with sodium hexyl sulfate and an internal Cβ paraf¬ fin sulfonate, Na salt, respectively. The composition of Example IV B can be modified by deleting the amine oxide and increasing the hypochlorite levels to 2.0%. The composition of Example B can be thinned by removing the polyacrylate thickener and provided in the form of a spray-on liquid in an appropriate dispenser with a spray pump. In any of the foregoing compositions, sodium silicate can optionally be added at levels of 0.04%-0.5%. The foregoing compositions exhibit good performance on kitchen dirt and greasy soap scum, have an acceptable sudsing profile, and rinse cleanly. In addition to the foregoing, it has now been determined that the formulation of stable cleaning compositions of the present type containing the above disclosed short-chain surfactants can be carried out in a manner which provides not only optimal cleaning performance over a wide variety of soils, especially household kitchen type greasy soil and bathroom type soap scum soil, but also optimal bleach stability. According to the practice of this invention, the proper selection of the short- and long-chain surfactants and use of the proper levels of total surfactants in the most preferred compositions allow even concentrated composi¬ tions containing as much as 3% hypochlorite to be formulated. Such compositions have satisfactory stability under typical in-use conditions. In this regard, it is to be understood that the proper selection of both short-chain and long-chain surfactant components is important in order to maximize stability. While quite effective for their intended use under many circumstances, it has now been determined that higher levels (e.g., 2-4%) of the semipolar amine oxide surfactants may be sub-optimal under long- term storage conditions, especially at hypochlorite levels in the 2%-3% range. If semipolar surfactants are desired, long-chain (C12 and above, typically C12-C18) phosphine oxides are a class of such surfactants which can be substituted for their amine oxide counterpart surfactants, and which exhibit improved stability in the presence of hypochlorite. Alternatively, and in addition to those disclosed hereinabove, stable anionic surfactants which can be used include the C12-C16 alkylphosphates, C12-C16 alkyl phos- phonates, the family of surfactants sold under the name DOWFAX, including the sodium alkyl (C6-C16) diphenyloxide disulfonates, and the like. However, it has surprisingly been discovered that the C11-C13 alkylbenzene sulfonates ("LAS") are not optimal for use in bleach-containing compositions. Accordingly, if hypochlor¬ ite is used in the product, it is preferred to select a non-LAS surfactant. Preferred long-chain surfactants include C12 alkyl sulfate. Somewhat higher cleaning performance on greasy soils may be achieved using the C14-C18 alkyl sulfates. Likewise, the C12-C18 alkyl sulfonates may be used as the hypochlorite-stable long-chain surfactants herein. The presence of the short-chain surfactants in the manner of this invention not only enhances overall cleaning performance, but has the additional advantage that they help solubilize the C 4-C18 alkyl sulfates and C12-C18 alkyl sulfonates in the liquid compositions. This additional solubilization effect is especially helpful when C16-C18 long-chain surfactants are being used in the compositions to achieve superior grease removal results. 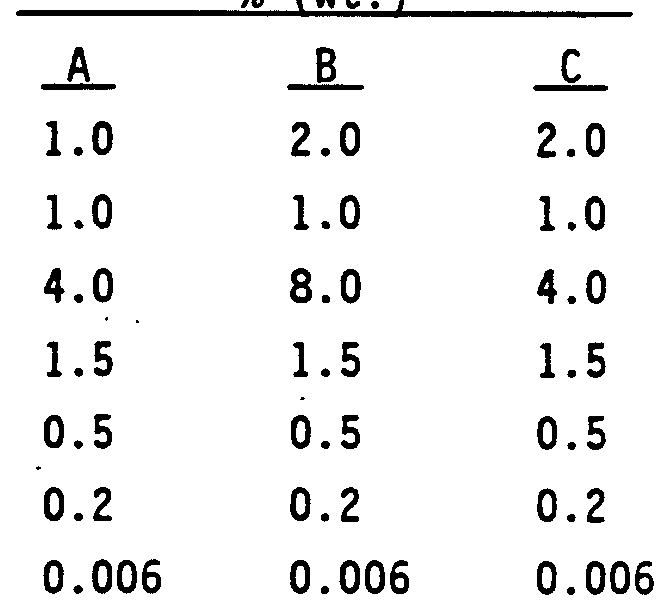 Typical usage levels range from about 1% to about 6% by weight of the compositions herein. With regard to the short-chain surfactants, the preferred classes of materials remain the C6-C8 alkyl sulfates and sulfon¬ ates and C6-C10 paraffin sulfonates, with sodium octyl sulfate being most preferred. Typical usage levels range from about 2% to about 6% of the compositions herein. Moreover, it has now been determined that when formulating base surfactant combinations which can be used to provide optimally stable hypochlorite-containing compositions comprising mixed long- and short-chain alkyl sulfates and paraffin sulfonates without the amine oxides, the overall total levels of short chain plus long chain surfactant should preferably not exceed about 10% by weight of the compositions, and preferably are in the range of from about 2% to about 10% by weight of the compositions. Of course, this can vary somewhat depending on the concentration of hypochlorite and the degree of stability which are ultimately desired. For example, at concentrations of about 1% hypochlorite the total concentration of surfactants can be as high as 10%; at hypochlorite concentrations of about 2%, the total concentration of surfactants can be up to about 6%; at hypochlorite concentra- tions of about 3%, the total concentration of surfactants can be up to about 4%. In addition, when formulating compositions of the present type without amine oxides, it further transpires ths the use of weight ratios of long-chain surfactant:short-chain surfactant of at least about 1:1, preferably about 1.5:1, but no more than about 5:1, can provide excellent cleaning benefits on both the aforementioned bathroom and kitchen-type soils. Thus, by taking into consideration the above-disclosed amounts of total surfactant levels and these long-chain:short-chain ratios, it is possible to provide products which are optimal both with respect to broad-scale cleaning performance and stability with hypochlorite. EXAMPLE IX A surfactant mixture suitable for use as-is, but designed especially for use in combination with up to 3% hypochlorite is as fol1ows. EXAMPLE X A clay-thickened composition is prepared by mixing 1.3% of BENTONE EW into the composition of Example VIII. EXAMPLE XI A thickened product is prepared using a high shear mill (TEKMAR) and comprises 1.3% BENTONE EW, 1% NaOCl, 1% dodecyl sulfate, 4% octyl sulfate, dye, perfume and a water carrier. The composition exhibits excellent cling to vertical surfaces. 1. A cleaning composition, comprising a mixture of: i) a short-chain water-soluble surfactant which comprises a hydrophilic substituent and one or more hydrophobic hydrocarbyl substituents wherein the maximum chain length of any of said hydrocarbyl substituents is Co; and ii) one or more conventional long-chain, water-soluble surfactants. 2. A liquid, bleach-containing cleaning composition which comprises: i) from 0.6% to 10% by weight of a short-chain surfactant; ii) from 0.5% to 8% by weight of a bleach-stable, long-chain surfactant which is a member selected from the group consisting of paraffin sulfonates, alkyl sulfates, phosphine oxides, alkyl sulfonates, diphenyloxide disulfonates, alkyl phosphates, and alkyl phosphonates; iii) from 1 % to 3% by weight of a hypochlorite bleach; iv) an aqueous carrier, said composition having a pH of 12 or above. 3. A composition according to Claim 1 wherein the long-chain surfactant is a non-amine oxide surfactant. 4. A composition according to Claim 1 wherein the long-chain surfactant is an amine oxide. 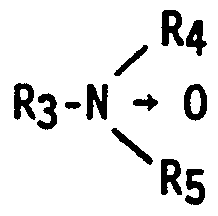 wherein R is a C-.2-C2n a'M substituent and R4 and R5 are each Cj-C3 alkyl substituents, at a weight ratio of (i):(ii) of 4:1 or greater. 6. A composition according to any of Claims 1-5 wherein the weight ratio of surfactant (i) to surfactant (ii) is at least 1 :1. 7. A composition according to any of Claims 1-6 wherein the ratio of surfactant (i) to surfactant (ii) is from 1.5:1 to 5:1. 8. A composition according to any of Claims 1-7 wherein the short- chain surfactant is a Cg-Cg alkyl sulfate or sulfonate. 9. A composition according to any of Claims 1-8 wherein the short- chain surfactant is selected from internal alkyl sulfonate and alkyl sulfates. 10. A liquid composition according to any of Claims 1-9 which comprises a hydrochlorite bleach..
11. A composition according to any of Claims 1-10 which comprises from 1 % to 3% of hypochlorite bleach, from 1 % to 6% by weight of said long-chain surfactant, and from 2% to 6% by weight of said short-chain surfactant. 12. A composition according to any of Claims 1-11 comprising not more than 10% by weight of the mixture of long-chain surfactant and short-chain surfactant. 13. A composition according to any of Claims 1-12 which additionally contains a thickener. 14. A solid composition according to any of Claims 1, 3-9, 11 and 12 which comprises a solid source of chlorine bleach. 15. A composition according to Claim 14 wherein the source of chlorine bleach is sodium dichloroisocyanurate. 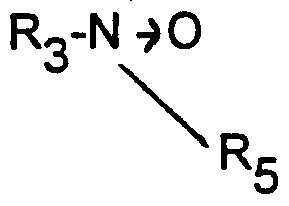 DE3585293D1 (en) 1984-03-30 1992-03-12 Procter & Gamble Stable suspension of pigments in aqueous hypochlorite-bleach compositions. ES2200511T3 (en) 2004-03-01 Aqueous multiphase cleaning.